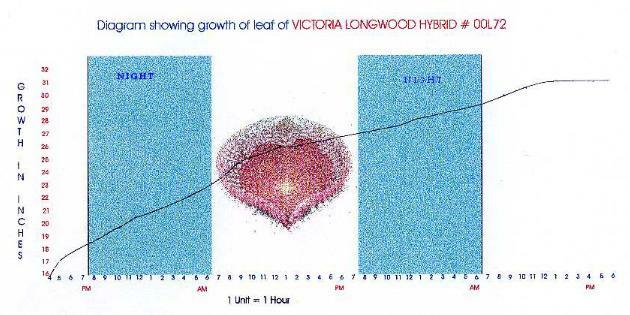 In the growing season of 2000, I recorded the growth of the leaf of Victoria Longwood Hybrid # 00L72. The recording of the time and growth was started when the leaf had fully reached the surface. At that time it measured 16 inches. The growth showed a regular pattern in day as well as night time except that in the afternoon the growth was at a higher rate. The most interesting part was that when a fresh leaf spreads on water, the configuration of the leaf almost resembles a parachute with all its wrinkled cloth and ropes. The leaf goes on growing with its wrinkles smoothing out slowly as the leaf gets bigger and bigger and the growth stops suddenly only to grow out 1 or 2 inches more in a few days time. In the parachute also the expansion stops as soon as the ropes holding out the cloth reaches its maximum length. What a true copy! 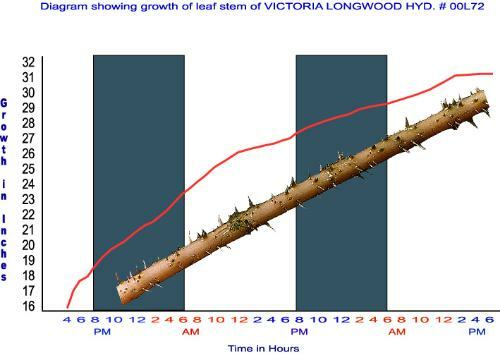 The stem grew approximately 1 inch per hour, leading to the conclusion that Victoria adjusts easily to flooding.